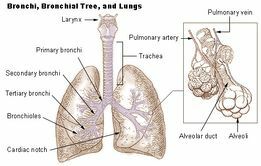 The two lungs are organs responsible for respiration, air enters and leaves the lungs via main the bronchi, which are branches of the trachea. The lungs supply the body with oxygenated blood, which allows us to live. The pulmonary arteries deliver deoxygenated blood to the lungs from the right ventricle of the heart. Oxygenated blood returns to the left atrium via the pulmonary veins and is then pumped through the rest of the body to deliver oxygen where needed. roper lung function is essential for quality of life, yet there are many ways this can be disrupted including disease and infection. If not monitored and treated these can cause spasms, sputum retention, inflammation and irritation which all leading to poor lung function, increased work of breathing and reduced quality of life. 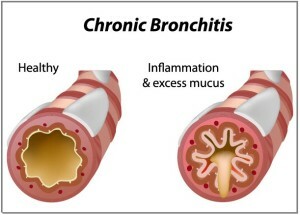 Chronic Bronchitis (CB) is defined as a chronic cough and sputum production for at least 3 months a year for 2 consecutive years. It is covered under the umbrella term of Chronic Obstructive Pulmonary Disease (COPD). The COPD spectrum ranges from Emphysema to Chronic Bronchitis and it occurs when the airways become inflamed and the air sacs in your lungs are damaged. Emphysema occurs when your alveolar membrane breaks down whereas CB is the inflammation and excessive mucus build-up in your bronchi. Many patients have characteristics of both, putting them somewhere along the spectrum. COPD kills around 30,000 people per year in the UK alone and it is estimated that around 3 million people in the UK have COPD, 2 million of which are undiagnosed. CB occurs in 3.4 to 22% of the US adult population and rates are even higher in patients with COPD. The prevalence of the disease has a great impact on society and on the health care system around the world. The primary risk factor for CB is smoking, and up to 25% of long-term smokers will go on to develop COPD. Other factors are long-term exposure to air pollution, fumes, and dust from the environment or workplace. CB is caused by overproduction and hypersecretion of mucus by goblet cells, increasing airflow obstruction. This can be due to smoke inhalation, a viral or bacterial infection, or inflammatory cell activation of mucin gene transcription. As mentioned, smoking is the primary risk factor, this can be from those who inhale second-hand smoke as well as smokers. This is caused by the inflammation and permanent damage to the airways due to toxins in cigarette smoke. Other factors include fumes and dust and air pollution which can all affect your lung tissue when inhaled. There is also a genetic factor associated with COPD, it is a deficiency in alpha-1-antitrypsin. This genetic marker is indicative of Emphysema, but many patients on the COPD spectrum have characteristics of both Emphysema and CB and should be taken into account. The pathological foundation for CB is due to the over-production of mucus in response to the inflammatory signals, this is known as mucous metaplasia. In COPD patients this overproduction and hypersecretion is due to the goblet cells and decreased the elimination of mucus. The mechanisms responsible for mucous metaplasia in COPD patients is associated with the function of the T cells, although it is still poorly understood. 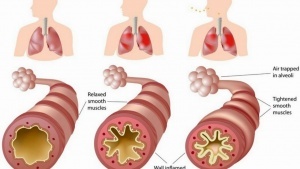 It is believed to be linked to end production of the Th2 inflammation cells while the cellular response is thought to be attributed to the Th1 inflammation cells, both produce cytokines that have an influence on mucus production associated with COPD patients. Mucus metaplasia causes airflow obstruction by several mechanisms: it causes luminal occlusion; the thickening of the epithelial layer intrudes on the airway lumen, and the mucus alters the airway surface tension. These all leave the airway at a greater risk for collapsing and decreases the capacity for airflow and gas exchange. It was also found that smokers with moderate COPD and CB had a greater number of goblet cells in their peripheral airways, which increases the potential of mucus in the lungs. It was found that as a greater number of small airways were blocked with mucus the greater the severity of the disease. These symptoms would be persistent for at least 3 months a year for 2 consecutive years to be considered Chronic Bronchitis. Spirometry Test: This is a breathing test to assess how well your lungs work. You breathe into a machine and two measurements are taken; forced expiratory volume (FEV1) and forced vital capacity (FVC). The readings are then compared to normal ranges for your age, to determine if your airways are compromised. Chest X-ray: This will show whether there are other lung conditions that may be causing the symptoms, or in what area the obstruction is in. This can give an indication of what areas to focus on during treatment, and the severity and progression of the obstruction. Blood test: This is to see if your symptoms could be due to anemia, or to see if the symptoms are due to the genetic marker alpha-1-antitrypsin deficiency. Phlegm sample: This is to check to see if there is an infection that is causing the symptoms, this is to primarily rule out other possibilities to ensure proper treatment. The treatment of CB may include a variety of interventions including management through medications, education, physical exercise and respiratory exercises. The goal of the physiotherapist should involve education, improve exercise tolerance, reduce exacerbations and hospitalization, assist in sputum clearance, and increase thoracic mobility and lung volume. There are various kinds of short term and long term medications individuals with CB might take to reduce flare-ups, decrease obstruction, improve activity and decrease shortness of breath. These medications may include bronchodilators, corticosteroids, and antibiotics. Regular exercise can have positive effects on the management, treatment, and prevention of CB and COPD. Aerobic exercise and upper & lower limb resistance training have shown positive changes in the reduction of airflow obstruction, clearing of airways, improved functional capabilities increased energy levels and sputum expectoration. Exercise programs should be under the supervision of the treating clinical team and a discussion with the general practitioner should be had before taking part in any exercise program. The use of various positions to assist in the expectoration of sputum by using gravity to move sputum towards the throat and mouth. Is can be used with other treatment techniques. These positions can be modified for each clients condition and their preferences. Ideally, the client is placed in a position where the affected area is higher up than the unaffected area. Consists of the combination of Controlled Breathing, Thoracic Expansion Exercises and “The Huff” or Force Expiration Exercises at different lung volumes. Can be used to reduce bronchospasms, coughing, airway obstruction and promote collateral airway ventilation and sputum expectoration. This technique can be modified to the needs of the client and their preferences. There is presently no cure for CB. However, with lifestyle changes, education and proper management it is possible to prevent exacerbations of the condition. Smoking can irritate the lungs leading to irritation, inflammation, and scar. The longer an individual smokes the more damage occurs to the lungs which can lead to increased amounts of exacerbations of the condition. By quitting smoking this can decrease the amount of exacerbations, hospital visits and lead to a better quality of life. Practicing good hygiene can reduce the spread of germs, bacteria, and infections. This can help reduce the risk factors associated with bronchitis and help reduce exacerbations of chronic bronchitis. Education can play a vital aspect in the prevention and management of CB. Education about the presenting condition, risk factors associated with it and treatment can help reduce anxiety associated with the development of any chronic condition and a proper understanding of the condition and how to manage it can encourage the individual to take a proactive approach to their management program. ↑ Drake RL, Vogl AW, Mitchell AW. Gray's Anatomy for Students. 2nd ed. Edinburgh: Churchill Livingstone, 2010. ↑ 4.0 4.1 4.2 4.3 4.4 British Lung Foundation. COPD: Chronic obstructive pulmonary disease. http://www.blf.org.uk/Page/chronic-obstructive-pulmonary-disease-COPD (accessed May 4 2015). ↑ 7.0 7.1 7.2 7.3 7.4 7.5 7.6 Hough A. Respiratory Disorders. Physiotherapy In Respiratory And Cardiac Care: An Evidence-Based Approach. Fourth ed. : Cenegage Learning; 2014. p. 77-84. ↑ 8.0 8.1 Dressendorfer R, Haykowsky M, Eves N. Exercise for Persons with Chronic Obstructive Pulmonary Disease. Available at: http://www.acsm.org/docs/current-comments/exerciseforpersonswithcopd.pdf. Accessed May, 6, 2015. ↑ 12.0 12.1 National Health Services. Bronchitis. 14/07/2014; Available at: http://www.nhs.uk/conditions/Bronchitis/Pages/Introduction.aspx. Accessed May, 06, 2015. ↑ Mayo Clinic Staff. Diseases and Conditions COPD Prevention. 2014; Available at: http://www.mayoclinic.org/diseases-conditions/copd/basics/prevention/CON-20032017. Accessed May, 6, 2015.